Hiring interns is a great way to gain some extra capacity at work. At the same time, you are able to assist these students by providing them with real-world work experiences and the development of their portfolios and business skills. I feel strongly about bringing on interns. It’s a great way to give back. I also frequently receive calls from college students whose assignment is to interview an alumnus about how college shaped them and how that experience translates into the work world. In both instances, I spend time mentoring and coaching them. Whenever possible, I connect them with others and offer job leads. I’m always proud when they land their next internship or, even better, that first job. The other day when I had finished offering advice, I realized that the advice I was sharing with an intern, still applied to those seeking a job. It doesn’t matter where you are in your career, the basics remain the same. 1) Join groups to network. Of course, I’m going to encourage you to join NFPW. But don’t limit yourself to one. And don’t limit yourself to your profession. Join a service organization, volunteer. The key is to meet people who can connect you to others. At the same time, you may be able to help others out. 2) Post a profile to LinkedIn. Most HR offices check to see if you have a profile. They want to know that you are visible and are keeping your skills fresh. For those who say they don’t have enough time, I say, you can’t afford to not be visible. In less than an hour you can create a simple profile. Then check in once a month. That’s not a large investment in your career. 3) It’s always appropriate to send a thank you. Some of us still send note cards, but an email thank you is equally effective. It demonstrates that you have basic etiquette skills. 4) If you are a freelancer, are between jobs or have more to share than what is on your work business card, consider ordering a personal business card. I’ve created one that lists my role with NFPW, my blog and how to reach me. 5) Don’t stop learning. You may have finished your college courses, but the world is constantly changing. Keep up with current events. Participate in webinars and seminars. Attend conferences, including the Face 2 Face NFPW Conference in Chicago this August. If you follow these tips for interns, your career will stay on a solid path. 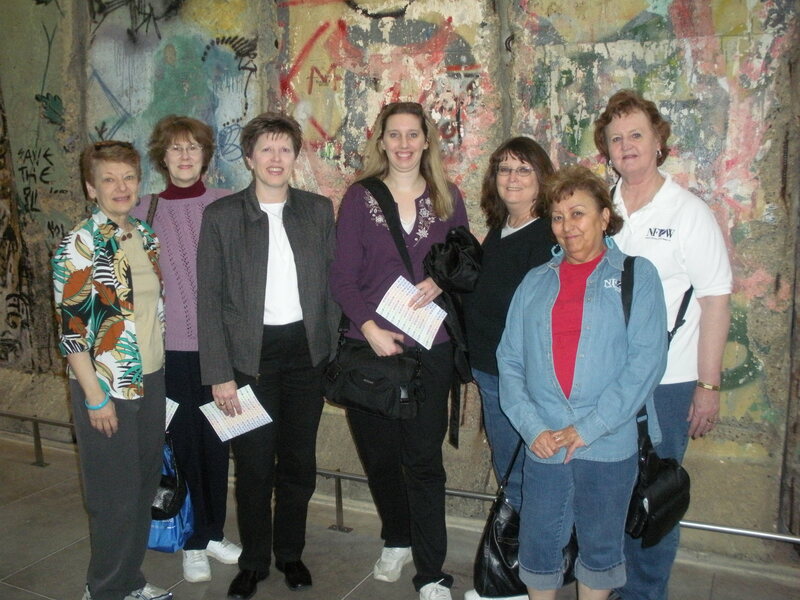 NFPW friends visit the Newseum in Washington, D.C. When people ask me about the benefits of NFPW, I always cite the friendships I’ve made. The first few times I attended a conference I hung out with those I knew, but I made an effort to say hello to others. Electronic communications may be great, but “Face 2 Face” conversations build relationships. In a few short years, I found myself eagerly anticipating the next conference because I would be seeing friends that gather once a year. Thankfully, Facebook and other social media platforms make it easier to stay in touch throughout the year. What I love about these friends is that they are always willing to help. I’ve called on many NFPW friends for advice, suggestions and plain ol’ help. They’ve always responded. NFPW is a group of women and men focused on all forms of communications. We aren’t competitive with each other; we’d much rather help each other. And when it comes down to it, having friends helps make life easier and more enjoyable. It’s a benefit that is hard to measure, but is immeasurable. Yet some people don’t understand the value of friends. I thought I would share this YouTube video that is the opposite of everything NFPW represents. None of these conversations would occur at our conferences. It’s a reminder of how fortunate we are to be proud members of NFPW. The opening session at last month’s NonProfit 2.0 focused on free agents – those who write about your organization and/or actively volunteer with it. The discussion evolved into a discussion about how to get an organization to commit to social media. Of importance to executives is measuring ROI. Beth recommends looking at the four I’s. 1) Return on Insight: You are learning how people feel about your organization and its work. You also learn how to do things better. 2) Return on Interaction: How well are you engaging with people? 3) Return on Investment: Are you converting people into supporters? 4) Return on Impact: You need to track real-world results, both online and on land. Social media is not simply about using it, it’s about engaging. “We need to engage and energize people,” Allison said. One way to do that is to use interns to coach senior staff on using Twitter and Facebook. The goal is to leave the organization with capacity. Another way to offer training is to hold a brown bag lunch and provide training to all staff. “You need courage and patience to do this well,” Beth said. Are You Listening or Just Making Noise? When a room full of social media users were asked about their listening experiences, one word emerged – overwhelmed. “But real-time monitoring and getting a response out within an hour can be more important than the meeting you are supposed to attend,” said Chris Abraham, president and founding partner of Abraham & Harrison, a company that offers a menu of services to build a company’s online presence. He and others were discussing the importance of monitoring social media, or listening, as part of the NonProfit 2.0 Unconference recently. Beth Kanter, author of “Beth’s Blog: How Nonprofits Can Use Social Media” and co-author of “The Networked Nonprofit,” summarized core competencies around listening. One thing that Wendy Harman, social media manager for the American Red Cross, does is compile the 16 to 20 meatiest comments each day and sends widely as an email. She notes that this keeps everyone informed and shows the reach of social media. The key is to provide them with the facts, Harman says. Beth recommended carving out 15 to 20 minutes each day or blocking an hour of your schedule on Friday. If you want to learn more about how to be a good listener, Beth has a great presentation on the topic. Blogger outreach is all about the courtship. At least according to Chris Abraham, president and founding partner of Abraham & Harrison, a company that “offers a complete menu of services to build a company’s online presence.” He shared his insights at the recent NonProfit 2.0 Unconference. One of the most effective ways to reach bloggers is to use a social media news release, which is one of the services of Abraham & Harrison. Dan also cautions about targeting mommy bloggers since everyone wants that group. The list of targeted bloggers should be either geo-targeted or topic based. And, it’s important to always refresh the list of bloggers. The initial email is a plain text, short message with a link to the social media news release. Video is here to stay, Catherine Baum, production coordinator for Double R Productions, told a NonProfit 2.0 audience recently. So what can you do to make your video better? Catherine along with Claudio Guglielmelli, production manager for Double R, shared many tips, starting with breaking the shoot into three parts: pre-production, production and post-production. “There needs to be lots of planning before you even go to shoot,” Claudio said. The planning should include deciding on your concept, what questions you will ask and what shots you need. “A script really helps with your editing,” Catherine said. 4) Keep a shot list so that when you go into the editing room you will know what you have. If at all possible, they recommended having a field producer for the shoot. “This person keeps everything organized,” Catherine said. Editing is the consuming part of the process. They both emphasized not putting everything you shot in the final video. “Shorter is better,” Catherine said. Editing software choices include Adobe Premier, Final Cut Pro and iMovie. Video Conveys Message, What Does Yours Say? Have you thought about sharing a message from your CEO, a sample of your latest project, client testimonials or interviews with field experts? You can do that with video and post it to your website, which is then 53 times more likely to come up on the first page of a Google search according to a report by Forrester. So what makes good video? Claudio Guglielmelli, production manager for Double R Productions, critiqued three levels of video. 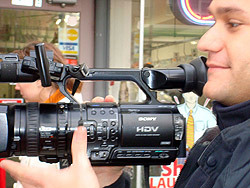 Claudio shoots video for a client. The first was using a flip-cam, which has grown in popularity, in part, because of its ease of use. Its downsides include a grainy look, no lighting and no camera mic. “What message are you sending?” Claudio asked. A better level is using a double R cam, which requires some studio lights and delivers professional quality. The best level is a professional shoot with a professional actor and the addition of music, graphics and a customized opening and ending. He challenged video users who say, “It’s just for the web,” noting that most people do their homework from the web. “What is the first impression you want to make?” he asked.